The management of the system can take place in different ways, which also means that the system can become more complicated, making it difficult for newcomer to instantly understand all the possibilities. This article seeks to enlighten you with a short explanation of the various ways the DC-CAR system can be implemented. 1. Independent control without interference from outside. This is the simplest way to create a realistic handling with more moving cars. The cars can drive independently without interference from outside. Provided that ingestelden correctly with a not too large will the speed difference between cars without collisions can find their way. It goes without saying that there is no security at crossings and consider after all we are talking about control without interference from outside. 2. Independent control with b.h.v. the vending machine features in the DC-Car decoder. If you want more variation and certain vehicles also independently carry out functions you can use the in built vending machine features such as bus stop vending machine or the fire service vending machine. To do this, to be the appropriate vehicle for seeing the HG1 Hall sensor option. By means of two magnets in the road surface, which are clogged, the functions are input. At the bus stop vending machine does this means that in passing the first magnet to go the right direction indicators and the speed is lower. In passing the second magnet stops the bus in the decoder for a programmed time. After verstriken by this time the left turn signals and will leave the bus. The fire service vending machine works in a similar way. Of course, this automatieken also be used for other vehicles such as a garbage truck or a courier service. 3. Independent control with influence d.m.v. existing Faller Car system control components. The operation is as above outlined, however, using the standard Faller stop rinse and circuits, which activate the reed contact in the car, we can affect the cars. Braking is abruptly, though the brake lights lights on. Pull up pull up in the decoder with the set delay. Is a car on a quiet then it will stop coil had traffic by the Anti Collision system behind the predecessor quit. Drive the predecessor away than will the underlying traffic also neatly one by one pull up like that in reality also happened. This gives a realistic road traffic however, it can be even better …. 4. Control via short distance infrared and DC-Car Function building block. The cars are standard equipped with an infrared receivers at the front. These receivers “looking” forward to see if there is a predecessor is and at what speed this is controlled. Via this infrared receivers, it is also possible to d.m.v. infrared transmitters (LEDs) the cars of commands. These LEDs serve or within the range of the recipients to be posted. That can so easily on the side of the road in parked cars, road marking poles, trash cans, etc. The range of receivers is a number of centimeters. Claus Ilchman has a function building block those developed DCC commands for some features. So we can turn on at a certain location so the direction-indicator lamps, decrease the speed or another desired feature. The function is independent of the address of the car and is so for every car. By means of circuits are the IR Transmitter led’s whether or not to make so that there can be enabled so selected, commands can be sent. The handling is very realistic because the Anti Collision System fully utilized. The cars can slowly brakes (by different speed commands) and pulling delayed on (also adjustable d.m.v. Resumes. 5. short distance infrared controller with a DCC Central, and any connected PC. It goes a step further with the direct control from a DCC Central such as e.g. the Intellibox. When DC-Car system that all can with an investment of only a few pounds. By the infrared led’s, along the side of the road, by means of a resistor and a diode on track output eg. to connect the Intellibox is addressed, so the cars individually,. This allows the speed and functions via the DCC Central. The cars than like locomotives or train. And can thus simultaneously in a mix of train and car, serves. Will be clear that we have to choose for the cars or other addresses than for the traction equipment on the railway. In this way, however, there comes a problem of send to Davis. 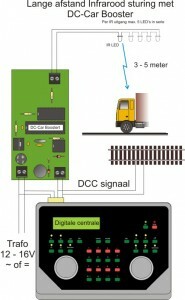 A DC Car decoder can at this way of control conflicting demands received. For example, a vehicle ahead let decrease the speed while the DCC Central maybe then just indicates increase speed. Gets the signal from the vehicle ahead in this case priority. This makes the car at that time no longer serves can be via the DCC Central. In this way it is also possible to send a’s on the DCC Central Road connected PC. All super anyway. …!! 6. Control via long distance infrared and DCC Central. Even better would be if we could send the cars with 1 or a few IR diodes above the course. That would be a significant simplification of the construction of the system. Well, this is also possible with the optionally available TSOP7000 infrared receiver that is built into the cars. The standard IR receiver works with an unencrypted signal. Infrared light is light with a certain wavelength and also comes in nature in the form of sunlight or light of fluorescent tubes and (halogen) lamps. These light sources act as a sort of Jammer for the standard IR receivers. Hence, also, that the range of this IR receivers but short. And that is exactly what is needed for the application as Anti Collision system in our model cars. This shows, however, that direct sunlight or a strong light source a short distance from our car movement can throw a spanner in the works. Control with an unencrypted signal over a longer distance is therefore not recommended. By now using encrypted/modulated IR signal, just as the remote control of your TV set is done, we can significantly increase the range. Your remote control of the TV works, after all, also about a decent distance and has too little affected by ambient light. Well, the TSOP7000 is a receiver with built-in decoder/demodulator. By this build into the cars we will be able to have a considerably greater distance our cars to drive. Echter……er must be an encoding/modulation of the signal because the TSOP7000 will take place our DCC commands do not receive and untranslated. Hiervoorheeft Claus Ilchmann the DCC Booster developed. The DCC Booster encodes/modulates the DCC signal to a signal that can receive the TSOP7000. To the DC-Car Booster in one or more special IR emitter Leds turn off and it above the model railroad to hang on we are now so able with some IR LEDs the cars over a range of several meters. In this way it is possible to send a’s on the DCC Central Road connected PC. Really a beautiful piece of engineering what us as modelers to his state again. But it can also without DCC Central……..
7. Control via long distance infrared and PC with software. 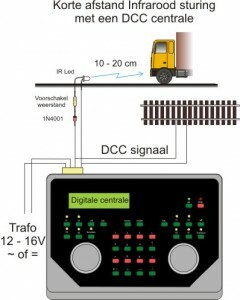 Model builders who want to aanschaven no (expensive) DCC Central and yet want to drive can be sent with the PC computer transmitter.